Hello, guys. How is everything going? It has been a while since we shared you product review last time, and so sorry for letting you wait so long . And today I will show you a review from a passionate lady Melissa Latham who has so many subscribers on YouTube. She has shown the package she received which includes all kinds of beads, jewelry wires, earring hooks and other jewelry supplies. We can know that she likes our products so much from this video. She displayed each piece and introduced them for us viewers. Then let’s watch this video together and see the materials mentioned. How do you think of these jewelry supplies? I am so honored that Melissa like our Pandahall products, and I am going to show you the items if it is not very clear for you after seeing this video. Wow, I love the color very much. You cannot miss this kind of beads if you want to make jewelry. 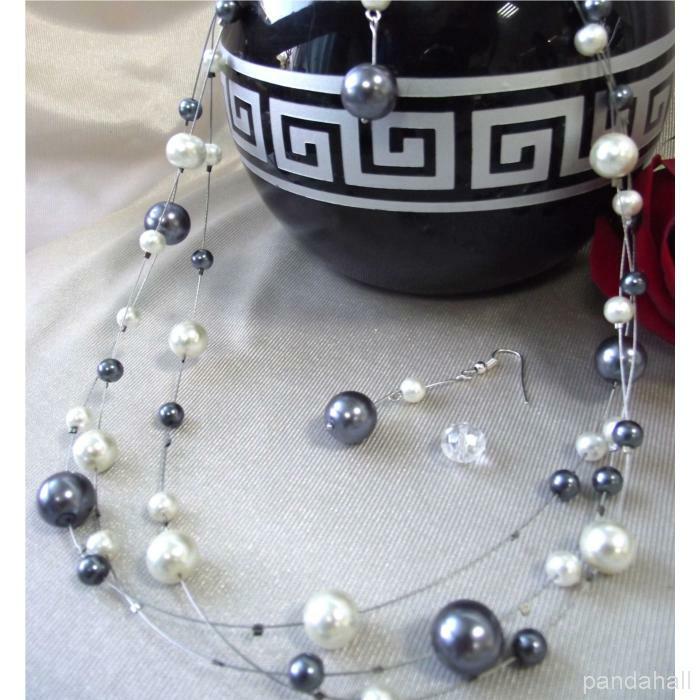 I believe you have noticed that many accessories are made by glass pearl beads nowadays. So pretty! Look at the first and second necklaces, they are so gorgeous! I just want to wear it right away. This kind of drawbench glass bead has its reins, so it looks more special! They are beads mentioned by Melissa in the video. What kind of bead do you like best? Or you are supposed to use them and make your own accessories. Just have a try! Cord or wire are always necessities for jewelry making. Which cord do you want to try first? They are just a part of the items and sorry for that I cannot list them all. Do you like these supplies? I bet Melissa will DIY nice jewelry with these beads and supplies. And I believe you also have your idea after seeing them, so are you going to make bracelet, necklace or earrings? Hope you can share your nice work with us! See you then! Who doesn’t love a good statement necklace? I am, so I’m always trying to find new ways to make one! This time I used cord in 3 different colors. Read on to see how to make this DIY statement necklace! Start by placing the cords the way you like. The two smaller pieces were the same length and I used the black one as the primary color. It’s hard to keep them in place so add a dab of glue between them to make it easier. Then cut two pieces of your wire and use it to wrap the cords together so they stay together. You can wrap that wire with your hands, it’s very flexible. Just make sure to tack the ends nicely at the back using pliers. Now glue the cabochon in the middle. Finally you’ll need to glue the clasp. The ends of this cord fray easily so to be able to fit them in the clasp a good trick is to cover them with some tape first. Glue them, let it dry and you are ready! Now go ahead and wear your new necklace! Be happy! If you love chains and beads, then double chain beaded bracelet is just perfect for you. Let’s see how to create it! Step 1: Let’s start now building the bracelet and specifically with the beaded part. First cut a piece of jewelry wire and use a crimp on the end to create a loop. Start with the stardust bead and then add the agate beads and end it again with the second stardust bead. Use the second crimp and make a loop. The beaded part is ready. Step 2: Proceed now making the chain part. Measure your wrist and then try to cut a piece of the gold plated chain that the half of it combined with the beaded part will be almost equal to your wrist’s length. Pleat the chain in the middle and pass the small jump ring. Connect the first jump ring with the second larger one. Repeat the same step on the second end of the chain. Connect the first end of the chain with the beaded part. and add on the free end of the beaded part the lobster. In order to do this, just use a jump ring. The bracelet actually is ready! Just have in mind to choose a lobster that will feet perfectly with the rest of the jewel and it will look as a really beautiful detail of the bracelet. Enjoy it wearing alone or with more beautiful chain or beaded bracelets. I love the combination of yellow gold with hot pink…what about you? And you know what is the best part of this bracelet? That looks different from every side… same bracelet, different styles! Wire wrapping is both one of easiest and most popular way to make wire wrapped jewelry including wire wrapped bracelet, wire wrapped necklace, or else jewelry with wire wrapping technique. There is no doubt that making wire wrapped jewelry needs many kinds of jewelry wire, like copper wire, memory wire, tiger tail, iron wire, aluminum wire and any other beading wire. Making wire jewelry is very easy to learn and you can make you own simple wire wrapped necklace or bracelet with basic wire wrapping techniques. Today we will show you some wire wrapped jewelry designs from our customers, hope it can inspire your own creativity and to DIY your own design. The first piece of design below is created by Наталья who used tiger tail wire to make this Tibetan style necklace. Tiger Tail Wires are very strong and flexible because they are made of braided wires. Special cutting or polishing makes this natural red beads strand vary in color and size, which is unique style of beads for jewelry making. This pretty wire wrapped necklace is made by our customer Iren, who is very smart and creative. The cornflower blue and white glass pearl beads make this necklace more elegant! Apart from using tiger tail wires, you can also choose cooper wires as awesome jewelry wires to design your favorite wire wrapped bracelets. 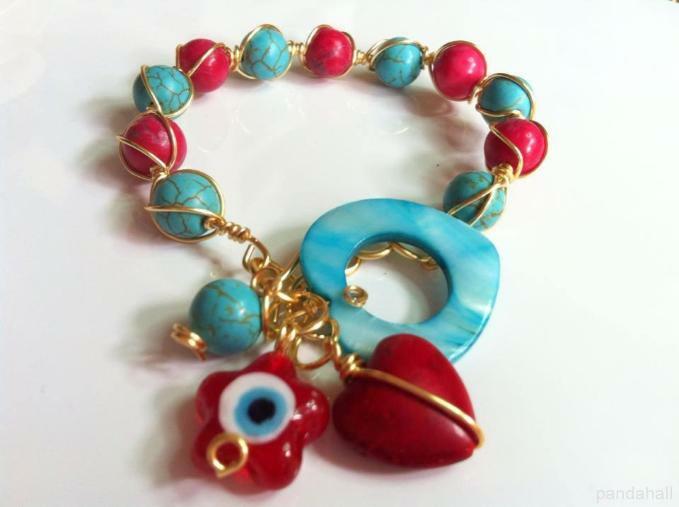 Look at these two charming bracelets, as the candy color bracelet and turquoise bead bracelet are all created by our customer Rafael Catacora. 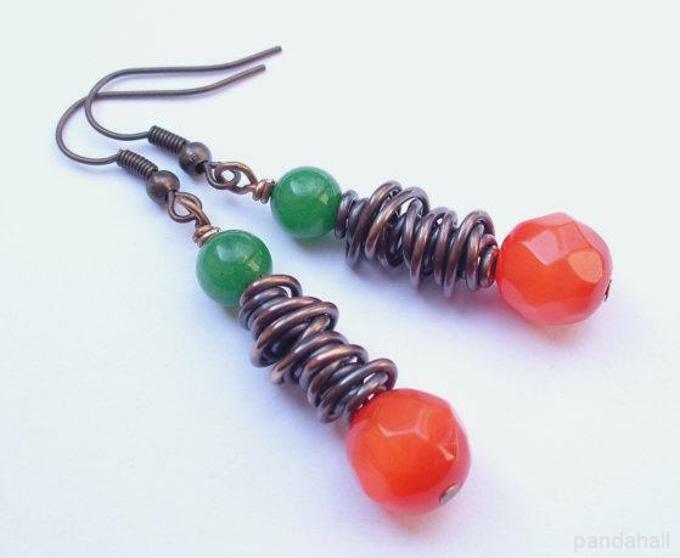 Thanks for Claudia Wesch sharing this vintage style wire wrapped earrings, which are consist of copper wires and jade beads with orange and green colors. The last wire wrapped jewelry is turquoise wire wrapped earrings, shared by Cristel Djasman. According to above beadworks shared by our customers, jewelry wires can be created into complex jewelry by making full use of your creative. Apart from making wire wrapped jewelry with jewelry wires, customers also use wires make some exquisite crafts. Here are some special crafters designed by our customer also. Enjoy! Have you ever created wire jewelry yourself? If not, why wouldn’t you make jewelry from wire? If you’re new without basic wrapped technique, here are two quite simple tutorials DIY Pearl Rings with Jewelry Wire and Make a DIY Simple Wire Ring for you to choose from. Have fun! Last week I posted a tutorial to turn nylon thread, jewelry wire and beads into a friendship braided bead bracelet. Afterward had a few requests for how to make rings with jewelry wire. Honestly speaking, I love to turn jewelry wire and beads to delicate wire wrapping jewelry, such as wire wrapped rings, necklaces, bracelets and wire wrapping earrings. This is a simple and quick way to make your own ring with beads and jewelry wire. Find a little time and you can make as much wire wrapped rings as you could ever need! Wrap 0.8mm copper wire around a maker 4 or 5 times to make a coiling, cut off the left wire and remove the coiling from the maker. Then string 2 ivory pearl beads, 1 clear bicone bead and 1 purgple glass pearl bead to the center coil. Cut a 36cm length of 0.5mm brass wire, coil it to secure the beads to stay where they are as the below picture shows.